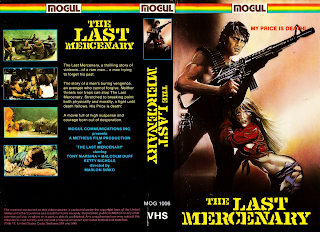 Several days ago a kind reader shot an e-mail to BoGD requesting a scan of Mogul's THE LAST MERCENARY. This cover is the best thing about the flick, originally entitled Rolf, as evidenced by my thoughts. I actually managed to find two copies of this tape and the scan above is the more damaged and stickered-up cover (touched up the scan a bit) of the two since the other copy is currently buried on the shelf. Pretty sure the chick by Rolf's package is copied from the awesome Frazetta depiction of once Clint Eastwood girlfriend Sondra Locke from the theatrical poster of 1977's The Gauntlet. Still, Mogul had some of the best illustrated VHS covers produced by a small video distributor in the '80s.